For the masses. 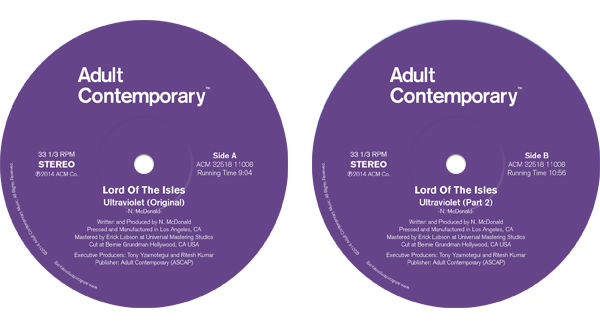 Includes a rework by LOTI himself. 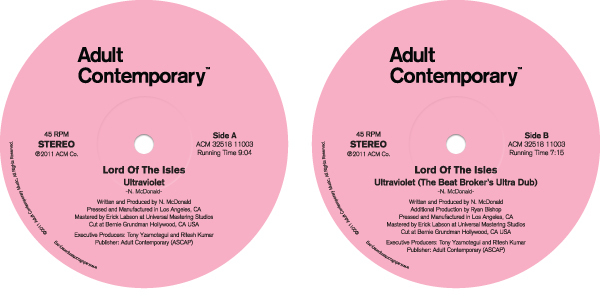 Lord of the Isles - Ultraviolet (Original & Part 2) 12"
Written and produced by Dan Hastie and D'ete Blackshire. Vocals by D'ete Blackshire. Remixes by Brennan Green. Available now. 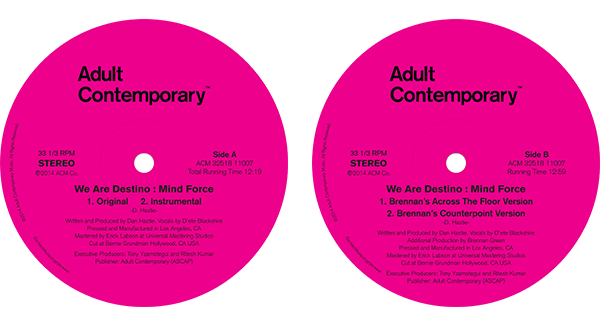 "Unfettered Balearic pop from We Are Destino on the always excellent Adult Contemporary label, previously responsible for some real vinyl shaped gems from Dorado, Lord Of The Isles and The Beat Broker. The original rendition of "Mind Force" is silky and sun kissed and will easily melt the hear of even the most ardent disco grump; rich synth waves, lapping and flowing with major chord surges, are carried by chugging dubbed out beats and coated by the stunning harmonies of D'ete Blackshire. Throw in some dazzling key work and two script-flipping remixes from Brennan Green (one pumping, later night affair, one super-laid back and sedate) and you have yourself something very, very special." We Are Destino - Mind Force 12"
Yagya's breath taking "Rigning Sjö" gets remixed by Mark E and Dennis Kane. Limited to 500 copies. 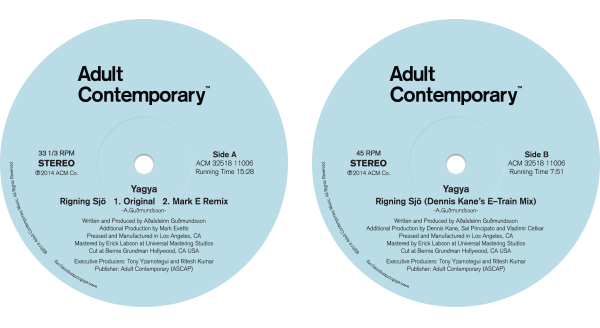 "With his approach to music hugely informed by the landscape around him, Yagya is a shining example of the thriving electronic music culture that emanates out of Iceland. With previous form on albums for Force Inc and Subwax, he now sidles up to Adult Contemporary for a sublime offering in the shape of "Rigning Sjo", which comes on as a masterful demonstration of floatation tank ambience and submerged techno tropes with an ethereal, orchestral beauty. Mark E follows up with a rubbery bassline and salvo of storm samples on his remix, taking a more mechanical approach than the artist is more commonly known for. Dennis Kane then finishes things off with a more taut disco-sizzling version that keeps the dreamy atmosphere but piles in the hooks." Yagya - Rigning Sjö 12"
Tony Watson - Nice Dreams 12"
Tony Watson as Nice Dreams featuring ROYAER aka Heavyhandz aka Roger Dickes. "Moonwalker" was written and produced in 2005 solely on an ASR-10. This was scheduled to be the first release on Adult Contemporary in 2009 but the master mysteriously disappeared until six-months ago when Juan Nunez surfaced with an unmastered WAV file off a CDR he found in his garage. The B-Side is Tony's new personal project memoralizing a time of release and change. Hatchback - Marin County 12"
It's finally here! Ships the same day. "Windsurf's Samuel Grawe has dropped some sublime if intermittent solo material under the Hatchback name over the years, gracing the excellent Lo Recordings with two albums as well as dropping a sublime 12" on the much missed THISISNOTANEXIT. Kudos goes to Watson and Ritesh Kumar's Adult Contemporary for coaxing this slab of Hatchback material out of Grawe with the 3 track Marin County 12" every bit as sumptuous as those aforementioned releases. Lead track "Paradise Drive" sets the tone and demonstrates Grawe's talent for arrangement with the languid piano tone perfectly complemented by the shuffling beat and rippling bed of warm textures that sit below. "Loma Alta" meanwhile sounds like New Beat gone Balearic whilst the soaring"Baker Beach" nudges up the tempo without any hint of sacrifice to the musicality." Dany Dorado 12" Single featuring “Crepusculo” and "Fuga"
Dany Dorado "Crepusculo" and "Fuga"
We grabbed this one from Ryan aka The Beat Broker a couple of years ago while inquiring about new music. We fell in love with "Pacific Break" immediately. Later that year our good friend Phil Mison was in town for a party we were hosting. We asked him if he would be interested in remixing it. Luckily he and Pete Herbert agreed and now we have the inaugural release on 180 Gram Vinyl to present. Please play on the player below to listen and feel free to share. Adult Contemporary Music Co. ©2014 All Rights Reserved.